This is an Impact Three-Light Mini-Boom Kit built around the Impact 12" and 5" reflector units with a high-heat ceramic socket. Each light's wooden control handle stays cool, and each light has a cord with an in-line switch. 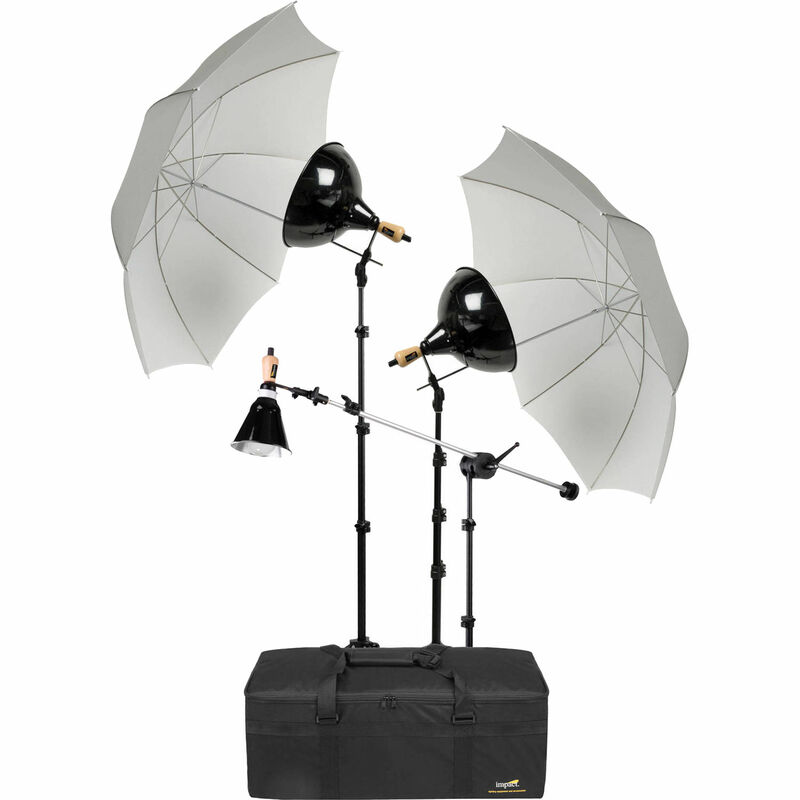 This unique kit includes umbrellas, a boom arm, air-cushioned light stands, and a case for transport and storage. Replacement Reflector for the Impact 10" Floodlight. Made of heavy-grade aluminum, are hand-spun and chemically etched to maximize the light output. Black painted exterior. This aluminum 8' Impact Air-cushioned Light Stand is 4-section light support with sure-twist section locks. Mini Boom Arm - 5' 3"
This Impact Mini Boom Arm is an aluminum lightweight boom arm with a 1 lb counterweight and swivel handle light stand mount. It can hold a small light fixture. The black Light Kit Bag #2 (34 x 13.5 x 12") from Impact makes transporting your lighting kit easy and secure. The bag is designed to hold three monolights along with their reflectors (such as Impact VC500LR), four stands, boom, umbrellas, cables and other support gear but can also be used to hold other lighting equipment instead. You'll have plenty of room to take along enough lighting gear for a portrait session - all packed in an organized and accessible way. A touch fastened divider tray separates the stands, boom and umbrellas from the lights preventing them from bumping together and causing scratches or damage. For additional smaller equipment such as cables and small accessories, there are three interior 10.5 x 8.0" zippered mesh pockets. The bag is made from soft, padded water-resistant nylon and contains six movable touch fastened interior dividers (6 large, 2 small) that will permit you to configure the bag to accommodate the gear you need that day. The Light Kit Bag is carried by its two 2" wide overlapping top carry handles that can easily be extended into dual shoulder straps. The contents are accessed via dual zippers that when placed together will accept a user-supplied lock. For even more protection, the bottom of the bag contains three rubber feet for when the bag is placed on the ground. And the bag folds down to a quarter of its height for convenient storage and easy setup. Whether for storage or transport, the Impact Light Kit Bag will serve both pro or amateur well. 2 x Floodlight Reflector - 12"
Box Dimensions (LxWxH) 7.3 x 7.15 x 6.05"
Box Dimensions (LxWxH) 27.0 x 3.8 x 3.5"
Box Dimensions (LxWxH) 36.0 x 8.0 x 3.5"
Box Dimensions (LxWxH) 35.0 x 14.0 x 12.5"
Three-Light Mini-Boom Kit is rated 4.3 out of 5 by 156. Rated 4 out of 5 by Gulf Coast Girl from Good value for the price This is a nice light set for the money. The reason I didn't give it 5 stars is that it came with no instructions. Perhaps it is intuitive for professionals who are used to working with lights, but for beginners like me, the lack of instructions was a bit frustrating. I was able to figure it out, although I don't like the connector that holds the mini boom on the light stand. It is either too snug or too loose and adjusting is a pain. That could definitely use a re-design. The carry case could be just a tad bit bigger so that re-packing is a bit easier. Overall, I'm satisfied with this purchase, it's perfect for my first set of lights. Rated 5 out of 5 by lesart from Easy and Affordable I recieved this product for Christmas originally from my husband. I was just beginning to launch my photographic business and needed an inexpensive and easy to use kit. Right off the bat I was asked to take pictures of a guest speaker for our school with sponsor tables... It was so nice to be able to set up so easily and not have to adjust lighting or change positions. the 2 lights with the umbrellas were the perfect amount of light and looked very professional. I am using a second kit now (purchased an identical one to the original) and love it just as much. Great value if you want simple, easy to use yet professional lighting. Rated 4 out of 5 by HWDynamo from Decent mobile light kit I'm a videographer usually involved in small, intimate shoots, and I needed a cheap (affordable) lighting kit. This one fits the bill pretty well. It's everything you think it would be: Compact, lightweight, easy to handle. The lighting mounts are wooden, so always cool to the touch, which is nice. My main complaint is that the tripods and boom are somewhat flimsy; using the lighting boom produces visible bending in the shaft of the tripod. I worry about the endurance of the metal under that kind of stress, and it probably wouldn't last very long if kept under those conditions. That being said, it's definitely worth the price. A good starter kit. Rated 3 out of 5 by Derek P. Miller from Good Beginner Set Up This is a good continuous light kit for the beginner. The included lamps provide a Kelvin rating for proper white balance. The umbrellas help soften the light. The stands are air cushioned to reduce the chance of breaking your lamps. My only complaint is with the inline switch power cords. 2 of the 3 switches burned out with two weeks. I had debated about returning them for replacements but ultimately decided against it. I was able to solve the problem by turning lights on/off through a power strip. That said, for the cost of this kit, I have been very happy with the results. Rated 4 out of 5 by Jesse from Good for the money You get what it tells you. The case it great, the lights work. You have to completely disassemble the lights to fit them in the case, which takes time and offers more opportunity to break the bulbs.Every review I saw stated that this was good for home studio, and not easy to move, so I knew that coming in. Not super durable, but again, for the money, it's great. The stands are the same as what comes with a Tota. I like this kit. It saved me a lot of money and does the job. I don't mind the assembly because I'm not doing it every day. For a REAL pro, maybe not the kit for you. For a semi-pro, definitely a good buy. Rated 1 out of 5 by Eric from Not worth the cheap price After reading the reviews and hearing about how the lights often burn out I decided to purchase extra bulbs. It was a good decision. After 5 minutes the 250W bulb burnt out, I replaced it and the spare also burnt out. One of the 500W lasted a whole 20 minutes before burning out. While this kit seemed like a good idea at the time, it was not worth the price. Lesson learned, I am returning it. Rated 4 out of 5 by Dominic from Very Nice !! Very Nice product! The light kit arrived in just a few days after I ordered. All the parts were there and teh quality is up to par as well. The only thing I can complain about is that there are no instructions. But, it is pretty straight forward, and after a quick internet search for directions, they are easy to set. Also, the kit does not come with lighy bulbs. I purchased 3 as back-ups, but had to use those. One of them blew out after the first 5 uses. I contacted B&H and they replaced the faulty bulb and shipped it with my order of 3 more as back-ups. Overall....nice kit lights and seem to do the trick. Anyone know how to set up the boom stand? You have to open up the clamp on the boom arm super wide. Like to the point where you think it's going to fall apart. Then you can slip the smaller hole right over top of the peg on the top of the light stand. You'll have to extend the top riser of the light stand a bit so you have space to slide it down. Then you can tighten it down on the top section of the light stand. The big hole on the boom arm bracket will be too loose. You have to use the small hole. Can these be used with cool lights? Are these lights disable with a dimmer? If you need dimmers for the lights in the Impact Three-Light Mini-Boom Kit, I would recommend purchasing the Impact D1000 1,000W AC Dimmer Control (110-120V), B&amp;H # IMD1000, for each of the lights in the kit. What kind of gels should I order for the boom light? The right type of gels to use would be dependent on your specific application. In general, its best to start out with a kit of gels like the Rosco Photo Lighting Filter Kit (12 x 12 ). This kit comes with a variety of colors and can be clip onto the Impact 5 Reflector Floodlight in the kit using two Impact Multiclips. It is important to leave about 2-3 inch gap between the gel and the light to prevent any hazards caused by the heat. Please see the images below for reference. Is everything in this picture included (Obviously not the model)? Yes everything but the model. Its a really nice way if your just starting out. Anyone used these for a group? Need lighting for indoor shoot of 4 people. Yes, you'll just need to keep an eye on where the shadows are casting and move folks accordingly as you would with any kit. This is a pretty nice system, all together! Does it come with 2 or 3 tripods stands ? i want to film indoor interview with a sony PMW-300K1 camcorder, do you advise me to take it?